Zaryadye park’s concert hall will open in 2018. This park will become a concert area for a variety of genres – from classical music, jazz, and stage festivals to complex opera productions and fashion shows. The unusual philharmony building, comprising 23.6 thousand square meters, promises to become one of the most visited places in the park. By walking along Pskov hill, one can reach the roof of the concert hall. From this viewpoint you can admire the beautiful views of the Kremlin, Moscow river, and historic center of the city. The only open portion of the building will be the facade, which will be made fully out of glass. A “dry” fountain will be built on the spacious square before the main entrance, meaning that the stream will rise not from a water reserve, but straight from the earth itself. The philharmony large hall can seat 145-1550 viewers, depending on the orchestra pit’s usage. A practice hall will also be opened in the building, in which not only rehearsals will take place, but also chamber and solo concerts. During the performance, the hall will hold up to 400 viewers, including not more than 80 standing spots. A sound recording studio, buffet, and relaxation area with open terrace will also be included in the building. The acoustics in the buildings were designed by a Japanese master – Yasuhisa Toyota, director of the company Nagata acoustics. He designed more than 50 concert theater halls in the world, including Mariinsky theater music hall in Saint Petersburg, the Walt Disney music hall for the Los Angeles philharmonic orchestra, and the House of Music in Helsinki. Those with FAN IDs for World Cup championship fans will be able to buy a museum ticket with a 30% discount. 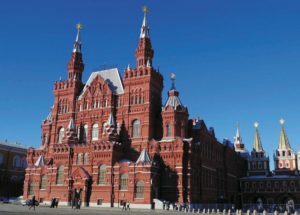 Free survey tours of the Historical Museum, Red Square, and grounds of the Saint Basil’s Cathedral will also be organized for the fans. These expeditions will be in Russian, English, French, German, Spanish, Estonian, and Chinese. One can get a World Cup FAN ID in the flagship center “My Document” located at Presnenskaya naberezhnaya 2, or at the distribution center located at Khamovnicheskiy Val street, 34. In order to get this ID, fans should have an identification document, as well as a blank ticket-order form, or simply a ticket for the match. A FAN ID allows to get the access to the stadiums, as well as to get the right for free ride on additional trains between organizer cities for the World Cup. A new useful feature has appeared on the Bibliogorod site (http://bibliogorod.ru). One can now find Moscow’s Department of Culture libraries, in which publications in 13 popular foreign languages are represented, on the interactive map. Among these languages are English, French, Italian, Spanish, German, as well as Chinese and Japanese. 37 reading rooms are depicted on the map. “Unfortunately, few residents of the city know that the city’s libraries have books in foreign languages, which are scientific, academic, and fiction works. Visitors can read works from Agatha Christie, Oscar Wilde, Charlotte Bronte, Theodore Dreiser, Stephen King, Dan Brown, and Haruki Murakami in their native language. What is more, the foreign literature fund preserves rare editions of works from the XVII-XIX centuries,” The Moscow Directorate for the Development of Cultural Centers reported. In total there are more than 100 reading rooms in Moscow, where more than 190 thousand books in foreign languages are kept. The interactive map on the Bibliogorod site shows only institutions which have no less than 100 publications in English and no less than 50 in other foreign languages. In order to find out which library has a book in one or another language, the user should go on the “Map” portion of the site, and then mark the desired languages. The map will show a list of the reading rooms. Afterwards, the user should click on the closest institution, after which the selected institution’s information will be shown, namely its working hours, telephone number, internet site, and address. In order to ascertain precisely which books are in the selected library, one should call the number provided. The largest fund of foreign literature is represented in the N. A. Nekrasov central library, which contains more than 90 thousand publications. Aside from artistic works, one can also find here rare professional books in French, English, German, Italian, and Latin. For example, there are multiple publications on architecture of the XVII-XIX centuries. In addition, readers can acquaint themselves with the invaluable French reference publication Encyclopedia, or Comprehensive Dictionary of Art, Science, and Crafts Didro i D’Alambera . The work was published in France in the second half of the XVIII century and reflects the technical development of Europe during the Enlightenment. There are over 40 encyclopedic volumes. More over, Nekrasovka has volumes of albums with engraved drawings. Rare publication on art, geography, history, numismatics, heraldics, and iconography all await the reader. 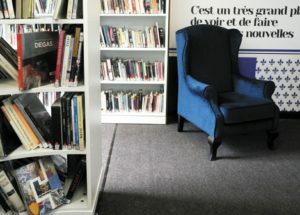 The majority of foreign-language books can be taken home, though rare-print books can be explored only in reading halls. According to Chanel’s press-service, their perfume and cosmetics boutique has once again opened on Malaya Bronnaya street as of the beginning of 2018. The new format is called Chanel Moscow Studio, and the boutique design and conception will change every two months. The studio’s guests will be able to try new products, do their makeup, and get consultations on skin treatment. The first two months at Chanel Moscow Studio are dedicated to the Chance aroma. The studio’s guests will be able to try products from Chance’s basic and bath lines, visit a master class from Chance’s leading makeup artists, listen to DJ sites, and receive skin care treatment consultations. We would like to remind the reader that the building on Malaya Bronnaya had earlier been the site of a temporary Chanel Coco Cafe pop-up boutique, a Christmas cosmetics store, an old-fashioned boutique, and a temporary space in honor of the Chanel Gabrielle aroma’s release. The grounds of the Luzhniki olympic complex will have landscape lighting as of spring, 2018. More than 750 diode lights will be set up along the Luzhnetskaya embankment, Slava and Centralnaya alleys, and along Festivalnaya square. In addition, light fixtures will be placed along the walkways, and architectural lighting will decorate both the monuments, trees and shrubbery that were planted this year. The lighting will be turned on the whole year round, and the majority of illumination will be a warm white light. On days when soccer matches take place, purple, green, blue, and red holiday lighting will be on in the olympic complex grounds. The artistic architectural lighting will in total be equipped on more than a dozen monuments and sculptures on the Luzhniki grounds. Monuments in honor of legendary soviet sportsmen – the soccer player Lev Yashin, the hockey player Valeri Kharlamov, and the Spartak soccer club founder Nikolai Starostina – will be illuminated during the evenings and nights. The bronze figure of the teddy bear that became the symbol of the XXII Olympics in 1980 will be adorned with lights. Illumination is also planned for Centralnaya alley near the monument to Vladimir Lenin and the Earth and Water sculptures, made by a group of soviet architects based off the designs of Vera Mukhina in 1957. Finally, trees and shrubbery planted this year in the most lively parts of Luzhniki will be illuminated. 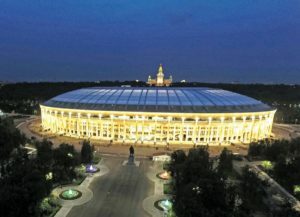 Three variations of architectural illuminations were developed for the Large sport arena on the Luzhniki olympic complex grounds. The brightest lights will be on during the 2018 World Cup soccer championship games. On days when regional games are being held, a less intense light will be turned on. At night, standard illumination on the facade will be on. IHG (InterContinental Hotels Group), one of the leading world hotel companies has opened its Holiday Inn Express Moscow – Sheremetyevo Airport hotel. Its located within easy walking distance from the D, E and F terminals of Sheremetyevo airport, which is the largest airport in Russia by number of passengers served. Owing to its convenient location, the hotel is the ideal pace for Russian and foreign travelers, as well as airplane crew members, to stay. The new hotel counts 190 “new generation’ rooms. The hotel building is designed around the opinions and reviews of its guests. 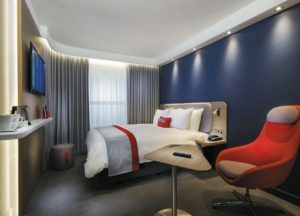 Every room provides wide beds with noise-suppressing headboards and conveniently-located USB-ports, as well as plasma TV panels with ports for connecting media gadgets. The designers rethought traditional working places in the room, creating a mix-zone for work and relaxation, inspired by an airplane’s business class. Free unlimited Wi-Fi is available for the hotel’s customers over the grounds of the whole hotel. The hotel’s interior and color scheme support the concept of the modern space, combining dynamism and comfort. Owing to their logical zoning, the Express Cafe & Bar and hotel lobby are perfect for both meetings with colleagues, and for spending time together with friends after or between a long flight. Sberbank’s science park in the Skolkovo innovation center, based on the architect Zaha Hadid’s project, is planned to be built in 2020. Sberbank’s science park in Skolkovo will be one of the most unique buildings in Russia. This is the architect Hadid’s last project, which the Russian company “A-project” has adapted. The science park will occupy 266 thousand square meters. More than 14 thousand people will work in the 10-floor building. The building will be 52 meters high, with 54 elevators and 16 escalators. Residential buildings will be constructed in parallel with this project, designed for employees of Sberbank working in the science park. As the reader may recall, the Skolkovo innovation center in the west of the city will become the largest testing grounds in Russia for modern economic policy. On the grounds of a specially-allotted territory unique conditions for research and development will be created, including for energy and energy-efficient technologies, as well as nuclear, cosmic, biomedical, and computer technologies. The Skolkovo innovation center is a state project realized by attracting investors. 2.6 million square meters of real estate will be built on 400 hectares of land. 30 thousand jobs will be created in the center. 20 thousand people will live here permanently. The first goods with “Made in Russia” printed on the package were released in 2018. The Russian export center released the e-catalogue madeinrussia.com especially for the promotion and sale of these products. One can find information on this site about manufacturers, brands, and their contact information. The site is available in 8 languages – Russian, English, German, Spanish, Arabic, Farsi, Chinese, and Hindi. For Russian manufacturers, Asian, South American, and Middle Eastern markets are considered to be the main priority. 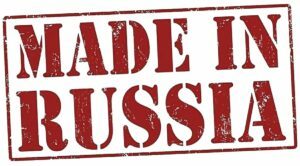 Foreign customers have already shown much interest to goods with the “Made in Russia” brand, ranging from mechanical engineering to food products. A space on the first floor of the Moscow TsUM has opened for the Australian skin-care, face-care, and hair-care brand Aesop. Famous Aesop oils with parsley seeds, shampoos, creams, and balms in aluminum tubes are being sold in Russia for the first time. 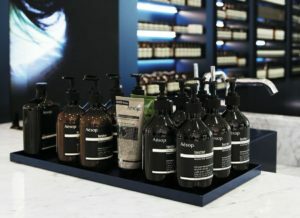 Aesop is an Australian brand which manufacturers its products using natural component without negating the benefits of the laboratory-developed products. As a result of this mix, Aesop’s products are both effective and pleasant for use. For the first-time user, we recommend the classic shampoo and conditioner, the face gel B Triple C Facial Balancing Gel (for when your skin is both greasy and flaky, and prone to outbreaks) or the cleansing mask Chamomile Concentrate Anti-Blemish. 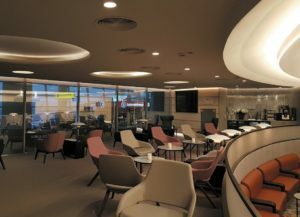 The new “Moscow” business hall opened in Sheremetyevo airport on the third floor of Terminal D (the international flights zone, after passport control), near the exit to gate 30. It is designed for 117 seats, accepts guests 24 hours a day and offers two restaurant areas and a comfort relax zone. The hall serves cardholders of Priority Pass, LoungeKey, Lounge Club, Diners Club, Lounge Charter. Passengers of any air company with a ticket from any class can use the hall’s accomodations one time by paying directly in the business hall at the administrator’s desk. The price is 3500 rubles for 3 hours of use. Children from 2 to 12 cost 50% of the adult fare.Children younger than 2 years of age are free if accompanied by an adult with permission to use the business hall. Upon airplane delays of more than 3 hours, an additional payment of 1100 rubles per person for every subsequent hour is charged. The new X-Fit fitness space will occupy more than one thousand square meters and will open in 2018 at the intersection of Malaya Dmitrovka and Stoleshnikov streets. Leading specialists, advanced fitness technology and the best methods are united under the single roof of a historical mansion in the very center of the capital – a place where life is active 24/7 and where new trends are born. 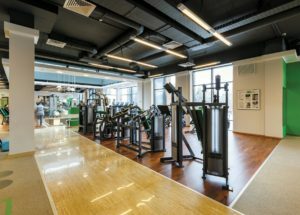 Advocates of the latest trends will have access to the stylish fitness-monsard’s format, which combines the spirit of the historical center of Moscow with fresh industries. Aside from status and comfort, guest will also have access to the most effective programs, the basis of which lie in the patented and tested training methods of X-Fit Smart Fitness. The gym’s main pride lies in its large complex of functional training with airbikes and rowing machines, with cable and weight zones and the opportunity for crossfit training sessions. Moreover, the club offers the service of specialists in various forms of massage. Personal and split-training sessions will be held in the club, as will be group programs in patented methods. All of the halls are equipped with the latest technologies, which will allow each member to build their own routine based on their individual fitness needsThe X-Fit fitness-mansard ‘s atmosphere motivates the capital’s residents and encourages them to care about their body, even with the capital city’s frantic daily routine. Vesper company, which specializes in deluxe-class realty and AccorHotels Group are announcing the signing of agreement of intention to open the first Fairmont hotel in Russia. 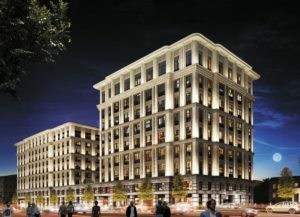 A five-star Fairmont Hotels and Resorts hotel with 142 rooms and 50 apartments is appearing in 2019 on the last free area of Tverskaya street (1 Tverskaya-Yamskaya, 2). The new hotel will become the first project by this company in Russia. The Fairmont’s history starts in 1907 in San Francisco, with 70 luxurious hotels in 20 countries currently. The legendary Fairmont hotels are famous over the entire world, and some have already managed to enter the pages of history: The Plaza in New York City, Savoy in London, the Fairmont in San Francisco, in which the UN Charter was signed, Fairmont The Queen Elizabeth in Montreal, where in 1969 John Lennon and Yoko Ono held their famous press-conference “Bed-in For Peace,” Fairmont Monte Carlo, which was opened by the princess of Monaco Grace Kelly, and many other locations. Vesper’s portfolio has 15 deluxe-class projects, 13 of which are located in Moscow. Investment in the implementation of the Tverskaya project, consisting of 25,200 square kilometers, will amount to 8 million rubles. “The appearance of a hotel of this kind will create a totally new level of standard for comfort, guest service and perfection in every detail. I am sure that we will be able to give Moscow a truly unique project. 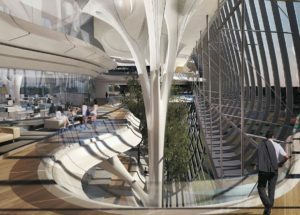 I think that the opening of this hotel will become a pivotal moment in the development of the entire comfort hospitality industry in Moscow and another boon for travelers from the world round,” noted Alexis Delaroff, AccorHotels’ regional director in Russia, Georgia, and the CIS. This architectural project, which is done in the style of the historical buildings on the main street of Moscow, was created by the SPEECH bureau. One 8-story building will have a hotel, while another, 9-story building will have deluxe apartments with finish and penthouses suites. They are joined by a common grounds with a shopping gallery, conference halls, wellness zone, restaurants, and underground parking. The owners of the apartments will have access to the entirety of the hotel’s infrastructure and service from one of the best hotel operators. NEKO. This bar on Bolshoi Putinkovsky street is of interest not only because of its trademark dishes, but also because of its drinks – cocktails, Japanese whiskey, and, of course, sake. Neko (Japanese for cat) is a laconic and elegant evening bar with a Japanese menu and complex Japanese-style cocktails. The Japanese dishes which are served here are varied in nature. Guests can try sushi rolls with soft-grained crab, sushi with seafood and edible gold or hamachi with linseed chips. 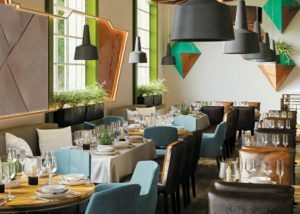 Pavel Maletsky, who has worked not only in the capital’s venues, but also restaurants in Dubai and Hong Kong, is responsible for the menu here. The sashimi here is worth its own mention, and is a classic Japanese dish in the form of sliced raw fish or other seafood. The menus has scallops sashimi for 520 rubles, or from tuna for 650. In addition, one can try Poke salmon for 520 rubles, or the trademark “Marble” rolls with premium beef, which cost 990 rubles. There is space for 40 people and the average check is 2000 rubles. MAGADAN. The venue located at Kutuzov Prospect, 12-1 specializes in seafood and caviar. The menu included fish and other seafood from Magadan, Murmansk, the far east, and other fishing regions of Russia. For snacks accompanying beer one can bravely take, for example, herring from the sea of Okhotsk on toast, an assortment of Magadan shrimp on ice or baked Sakhalin, scallops, or even an entire platter of seafood at once. For the main meal, one can choose the signature Magadan ear with fish balls, or for a hot meal there is a variety of whole fish dishes, or, instead of having to go through the trouble of making a decision, the guest can take a large fish tawa for the whole party. Caviar has its own section, the caviar bar, and includes five types: halibut, white fish, sockeye salmon, salmon and pike. Every portion is accompanied by oladyi (pancake fritters) with sour cream. 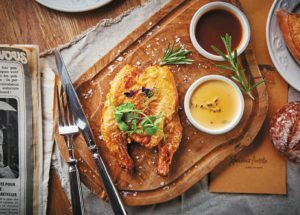 Regardless of the fact that the venue specializes in seafood, the menu also offers different culinary dishes. Guests can order poultry, meat, or vegetable dishes, as well as deserts. Just as satisfying as the menu is the nightlife here. On Thursdays, Fridays, and Saturdays there are planned live concerts on an enormous stage set up within the restaurant, with DJ’ed dance evenings that go until 6 in the morning. During the summer, a large, striking veranda that holds up to 100 people. SAUSAGE SHOP. 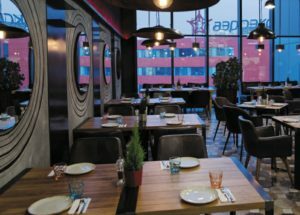 Sheremetyevo international airport has become the first airport in the country with a restaurant by Arkadiy Novikov. Now passengers in the “clear” zone of Terminal E can try artisanal dishes. The new restaurant works round the clock, and the average bill costs 2500 rubles. Natural craft sausages, ham, smoked meats and sausages are delivered to Sheremetyevo straight from the sausage shop located at the restaurant in Badaevsky brewery. The menu includes the hits from the first sausage shop: vienna, strasbourg, and duck sausages, grilled kielbasa, including white munich, chorizo fresco, ground beef with honey and cumin and boudin blanc. Light salads with accompany the dish with young cheeses from Syrovarnya, specialty sandwiches and an extensive breakfast menu: kasha (porridge), syrniki (fried pancakes), casseroles, omelettes, and eggs from the frying pan. The bar menu consists of Russian and imported craft beer, and also included classic draught lagers and wheat varieties. The first “Sausage Shop” was opened in the beginning of October 2017 at the Badaevsky brewery. It is a unique project, similar to nothing else in the world, with its own sausage shop in the restaurant. The food is prepared from nothing but the best meats and spices. HLEBNAYA LAVKA. The Hlebnaya Lavka chain has opened its second location in Terminal A of Moscow’s Vnukovo airport. Now passengers can refresh themselves with mouth-watering syrniki, croissants, soups and house dishes from the chef before their flight. The first cafe from this brand opened three years ago on Bolshaya Nikitskaya. This venue’s most interesting feature is its special breakfast menu, which is available not just in the morning, but the whole day. For example, the cottage-cheese casserole comes highly recommended for 410 rubles, eggs with fresh-farmed tomatoes, and salmon for 440 rubles, or oatmeal with cream-brouille and raisins for 390 rubles. In addition, an assortment of unique baked goods is also available: croissants with various fillings and belgian waffles. Speed of service is always a crucial point for any cafe, and even more so for an airport venue, In Khlebnaya Lavka dishes are served with maximal speed, be it pizza, a sandwich, or a hot dish with a side. The menu also offers an original salad with turkey sous-vide for 270 rubles, and mozzarella in honey sauce for 290 rubles. Crab cutlets serve as an excellent main dish for 690 rubles, as do beef pelmeni for 170 rubles. MAMA GOCHI. A new Georgian cafe has appeared on Bolshaya Dmitrovka with its own house cheeses. In total, this new cafe takes up the entire 3-floor building opposite the Moscow operetta. On the first and third floors are the cafe’s dining halls, while on the second floor is for the cheesemaking. Thanks to this floor plan, two large events can be held simultaneously without interfering with one another. The interior is designed with contemporary taste, though with obvious ethnic accents. Paintings from Georgian artists decorate the wood-panelled walls, and on the first floor 150 clay urns hang from the ceiling that serve as lampshades. On the third floor a feeling of Georgian hospitality is created by tandirs and ovens for making khachapuri. The menu offers mainly Georgian classics, although the cafe’s location in a tourist area has left it with certain European dishes. Khachapuri here can be ordered as an appetizer or as a main dish: there are 9 varieties made here. Khinkali is offered in portions of three: with veal (270 rubles), veal and pork (270 rubles), and with lamb (310 rubles). The cafe’s cheeses are made from farmer’s milk from Kaluga Oblast. Here they prepare nadugi, Imeretian cheese and four types of suluguni – classic, with mint, with paprika and greens. A portion of the cheeses are used for preparing dishes from the menu, while the remainder can be bought to go from the cafe’s store. The bar menu offers, among other things, chacha, infused with walnut, pomegranate, and orange. TOTORO. 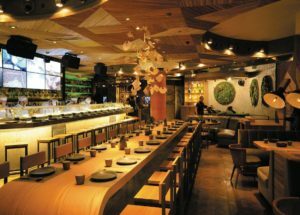 Aleksandr Rapoport opened his first Japanese restaurant on Kutuzovsky avenue. Having taken a course on democracy during this new project, the famed restaurateur appealed to themes from popular culture. “Totoro” is an animated film of cult fame from the Japanese artist Hayao Miyazaki and is the story of the friendship between two sisters and a friendly wood spirit. However, it can not be said that the restaurant’s design is heavily devoted to the cartoon. 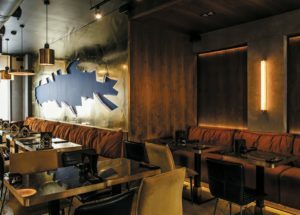 The venue’s inspiration is reflected only in a few striking accents: wall paintings with characters from various shows on the walls of the VIP room, and the waitresses embody Japanese schoolgirls. The cooking team is lead by the Australian Jonathan Curtis («Nedalniy Vostok», Mr. Lee, Fumisawa Sushi). The basic idea for the menu which he put together was using as much fresh quality fish as possible. The restaurant buys fish and seafood from the whole world over, but roughly 80% comes from Tokyo’s Tsukiji fish market, to which Moscow restaurateurs are increasingly turning. The pride of Tsukiji is the fabulous selection of tuna, which is why Totoro’s menu has eight kind of sushi made from it. (120-380 rubles) Sea Bass goes for 620 rubles, crab phalanx for 640; there is also striploin steak from marbled beef wagyu (1800 руб. ), and even kobe beef tataki – premium quality steer meat ( the most expensive thing on the menu, at 3200 rubles). Totoro has an enormous selection of sake – more than 8 kinds. Moreover, they offer a multitude of Japanese whiskies and Japanese craft beer. MOLLUSCA. A new restaurant has opened at Patriarch Ponds – this time with beer, Chilean mussels, of which there are 27 varieties. The restaurant is located in location comprising 100 square meters. The main dining area accommodates 38 seats, decorated with elements of brass, marble, American walnut and concrete. In total, contemporary design and art-deco are combined. The restaurant’s chef is Gianmaria Sapia, who designed the menu around molluscs. The main portion is made up of mussels, and for them it is worth coming from all ends of the city. 16 varieties of draught beer and nearly two hundred types of bottled beer. Beer enthusiasts will be surprised by the rare varieties of beer in this venue, such as Nøgne varieties from Norway. The average check at this restaurant is between 1500-2000 rubles. For example, marinara mussels go for 600 rubles per half kilo, and rotolo crab – for 250 rubles more. RYBA MOYA. This fish restaurant on 1 Tverskaya-Yamskaya, 21 destroys the stereotype that first-class seafood is a rich and unattainable pleasure. Wild fish freshly caught by fisherman in Morocco and twice a week shipped in by a special flight to this restaurant is a unique luxury. The angler fish, pagrus, and turbot are done to perfection, thanks to the Big Green Egg grill – one of the kitchen’s prides. This is simultaneously both a grill, a steamer, a smoker, an oven, and a tandir, which allow all of the healthy aspects of a fish to be preserved without over drying it and leaving it juicy. Live lobster straight from the Arab Emirates for the lowest price in the city (490 rubles for 100 grams) or octopus – also brought in by special important and straight from Peru, or tender salmon from Faroe Island, fired on the grill on demand – is all here. The restaurant also has local Russian products, providing them with their own section. Here there is cold-smoked arctic cisco, trout caviar without conservatives from Karelia, and also pike, stew, and sturgeon from Astrakhan. Of course, the menu would not be complete without Crimean mussels in garlic wine sauce. As a compliment to any dish homemade focaccia, with complimentary unlimited water poured at the table. 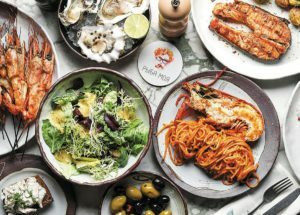 For those who do not especially love fish there is the Meat Meat Meat section, with all of the popular hits which made the previous restaurant, Perelman People, famous. Here is the signature rabbit liver pate from I Like Wine on Pokrovka, and the regular customers’ favorite of the I Like Bar on Shabolovka – veal medallions crispy potatoes, and a salad with roast beef and arugula. A veranda with space for 150 people is promised for this summer – the largest on Tverskaya street, with gigantic screens for the upcoming World Cup 2018, and aquariums with hundreds of live lobsters. GORYNYCH. 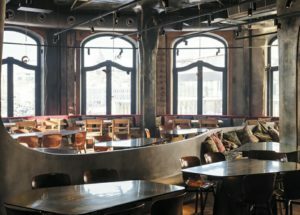 This restaurant has opened on the third floor of the Central Market and is a joint project between the restaurateurs Ilya Tyutenkov, Boris Zarykov, and chef Vladimir Mukhin. On one hand, the partnership is unexpected, but on the other is absolutely logical: Tyutenkov and Zarkov are two de facto leading personalities in Moscow’s culinary world and were bound to meet at some point. The open kitchen here is of immense proportions – a chef can only dream of such a working space. 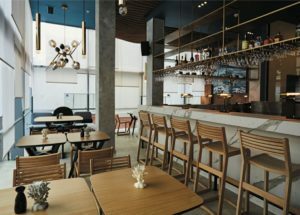 It would seem as if the kitchen received no less than a quarter of the entire premise, while all the working surfaces are a full-functioning part of the restaurant. 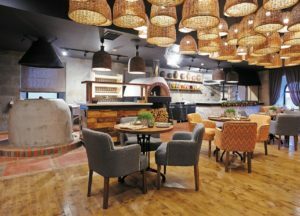 The long serving area is made from coarse wood, and at the head of the kitchen is the large, beautiful oven, which gives the restaurant its name. The bread maker’s stands separately from the kitchen – here they not only bake bread, but also take part in its creation from start to finish. The restaurant has its own miniature mill, the grain is bought separately, after which it is ground into flour in the restaurant and kneaded in a starter designed by the restaurant. First of all, the guest should try the pizza. Here there are such classics as margarita and four-cheese pizza (400 and 700 rubles, respectively), as well as the trademark filings, such as with burrata and truffles (which are to die for) or with eel and green onions. The grill occupies an important place on the menu (not in vain did they wait so long for its arrival from Texas). The menu includes steaks, lamb tongues, and seafood. Sauce can be ordered separately for each dish, and extras include bread crumbs, fried sausage and add-ons. While more than ten items are cooked on the grill, there are two separate blocks with meat and fish in Gorynych. Of special note are the beef cutlet (720 rubles), – a hefty breadless burger with cowberry sauce (they say it was a special invention by Zarkov), and octopus with potato (1170 rubles).